There are books that have been called important. These books are important because of their subject matter, certainly, but also often because of their pioneering nature. In Cold Blood, for example, is widely regarded as the first “true crime” novel. Fight Club, the novel, and its subsequent film adaptation, raised hackles for its blunt approach to masculine identity. Like Neil Gaiman, whose endorsement appears on the cover of my paperback copy, I believe Little Brother is an important book. 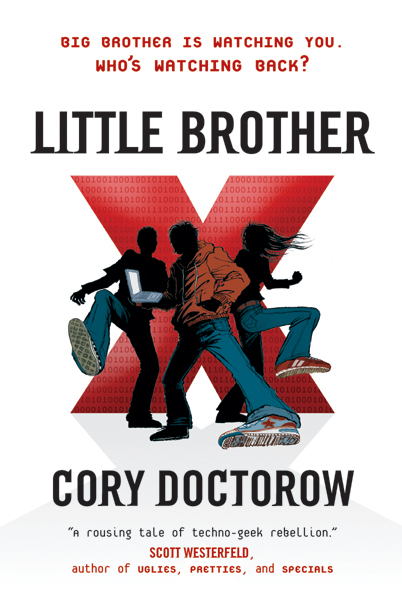 Written by geek-célébrité Cory Doctorow, proprietor of the excellent tech/culture/what-have-you blog BoingBoing.net, Little Brother is a tale of a nation in terror, of law enforcement run amok, of privacy, trust, individuality, citizenship, and rebellion all wrapped up in a coming-of-age narrative. Not only does the book deal with some of the issues Americans have faced post-9/11, but it seeks to educate geeky kids everywhere that hacking can be fun and easy and doesn’t have to be malicious. Also, privacy is serious business. Little Brother is about Marcus Yallow, a 17-year-old in San Francisco who goes by the online handle “w1n5t0n” (pronounced “Winston,” not coincidentally like the protagonist in Orwell’s Nineteen Eighty-Four). Marcus is a bright kid with his head on straight. He’s not into drugs or clothes or getting hammered every weekend. His friends are similarly inclined. They spend most of their time LARPing, or hacking their Xboxes, or subverting various network firewalls and tracking mechanisms their school has put in place to exert undue control over the students. Marcus memorizes the social security numbers, dates of birth, mothers’ maiden name, and home town of every school administrator. Not because he intends to rip them off, but just because he can. One day, Marcus and a few friends skip school to play an alternate-reality game in downtown San Francisco. Unfortunately, on this day a terrorist attack destroys the Bay Bridge and kills thousands of people on the bridge and the BART public transportation system. Marcus and his friends are only a few blocks away when it happens, and in the confusion are picked up by the authorities. Marcus is ruthlessly interrogated by a woman from the Department of Homeland Security (DHS). It’s clear she enjoys abusing her position and has little regard for the privacy of US citizens. The mere fact that Marcus has encrypted the information on his cell phone is enough to make him an enemy combatant in her eyes. Marcus is released, but remains under suspicion (and surveillance.) Meanwhile, the DHS has descended upon San Francisco, turning the city into a police state where everyone is tracked like a potential terrorist. Items as seemingly innocuous as metro and bus passes are used by law enforcement to monitor the movements of every citizen. When Marcus finds out that his best friend, who was gravely injured in the post-attack melee, is missing and still may be in DHS custody Marcus vows to take down the system. He’s pissed off, and he brings his considerable intellect and counter-intelligence talents to bear. I said before that Little Brother is an “important” book. I say that for three reasons. The first is obviously the subject matter. While eschewing partisan politics, Little Brother is about privacy and citizenship under a government whose paranoia leads to gross abuses of authority and suspicion of anyone who insists on the rights guaranteed by the Constitution. As the novel’s nameless DHS antagonist arrogantly says, “honest people don’t have anything to hide.” The novel spends considerable time debunking this ridiculous assertion. Second, Little Brother is important because it’s a young-adult novel that doesn’t talk down to its reader. At 39, Doctorow still understands what is important to kids as they reach maturity and start seeing the world as it really is. Not only that, but the novel is educational. It is filled with asides that explain relatively complex ideas like encryption, online privacy, radio-frequency identification (RFID), and what happens when you put a frozen grape in a microwave (“which has to be seen to be believed.”) These things aren’t explained using boring jargon, they become part of the narrative as our first-person protagonist Marcus details exactly how he plans to confound or embarrass the DHS thugs. I’m a huge computer geek and I know a lot of this stuff, but even I learned a few things from Little Brother. Third, I consider Little Brother important because of the way it was published. Doctorow, a copyright advocate and supporter of Creative Commons, published the book under Creative Commons license and made the book available electronically for free. Print versions can be purchased, of course, but if you want to read the book online you can, easily, with the blessing of its author. This kind of “walk the walk” attitude sets Doctorow apart from his peers. In all, Little Brother is a “ripping good yarn.” It is smart and honest and exciting. I’m generally a slow reader; I like to take my time. But I daresay I broke some kind of speed record reading Little Brother. It’s that awesome. Great review, Paul! I heard an interview with CD on NPR over the weekend and was very impressed by his belief and insistence on the Creative Commons ethic. This is especially impressive b/c it’s written for teens.